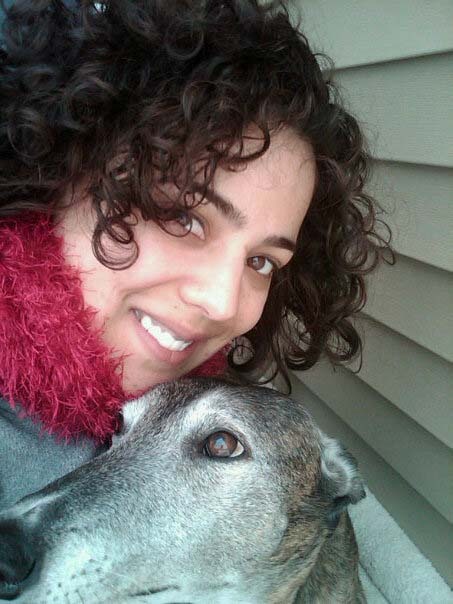 We are sorry to report that one of our adopters has lost her beloved greyhound. Emmy was diagnosed with a fast-growing and inoperable mass in her abdomen that ended up cutting off her colon and bladder from being able to eliminate waste. She was painlessly euthanized May 19, 2011 after weeks of tests and meds to help. Meisha Krutar adopted Emmy in September of 2006. Although Meisha is in the military, she always found a way to have Emmy with her no matter where she went. They were constant companions; therefore, Emmy’s death has had a big impact on Meisha. We are sorry that Emmy is gone, but we know that she had the most loving home with a caring and responsible adopter. Meisha is an example of why we do what we do. Run with the angels sweet girl.